With PortaSwitch®, you can become an active player in the wholesale DID market by granting other service providers access to your DID inventory and enabling them to provision DIDs on-demand. In addition, if you provide hosting services to your customers (i.e. 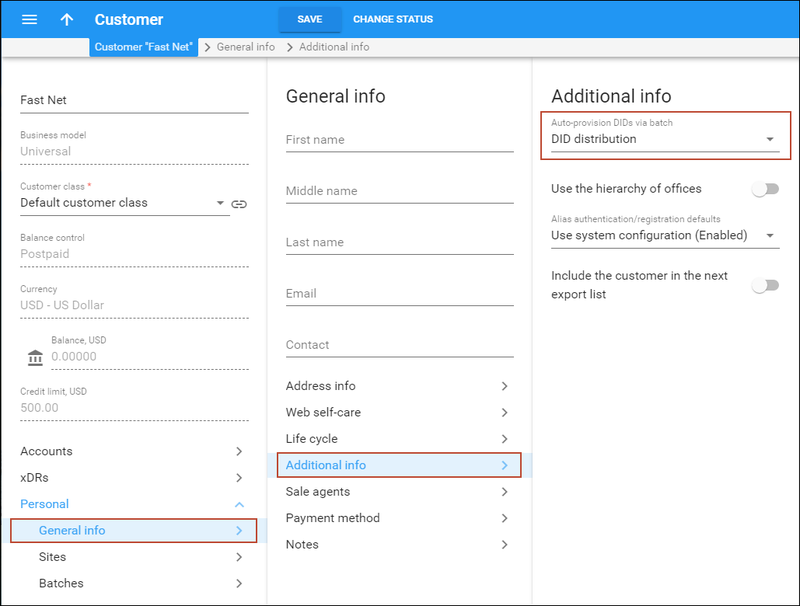 a customer operates in a separate billing environment), you can distribute the pool of DIDs across your own billing environments. Thereby you extend your clientele and become a wholesale DID provider. This chapter provides you with instructions for how to configure a wholesale DID exchange in PortaSwitch®. If you wish to buy DID numbers from another PortaSwitch® owner and provision them on-demand, please refer to the On-Demand DID Provisioning from PortaSwitch® Owners handbook. Your company, EasyDIDs, owns a pool of 10M DID numbers. Your wholesale partner, FastNet, is also a PortaSwitch® owner. FastNet plans to introduce residential services in their system and thus require DID numbers. · $5 monthly recurring fee. The checklist below assumes that you have already configured the routing between your system and that of your DID buyers according to the instructions provided in the previous chapters. Please refer to the Managing Available Phone Numbers (DID Inventory) handbook for instructions on how to upload DID numbers. To use the DID numbers, release them to the DID pool. 2. On the DID inventory page, go to DID numbers list. 3. On the DID number search panel, select the specific vendor batch from the Vendor batch list and click Apply filters. 4. Select the appropriate DIDs and click Manage. 5. 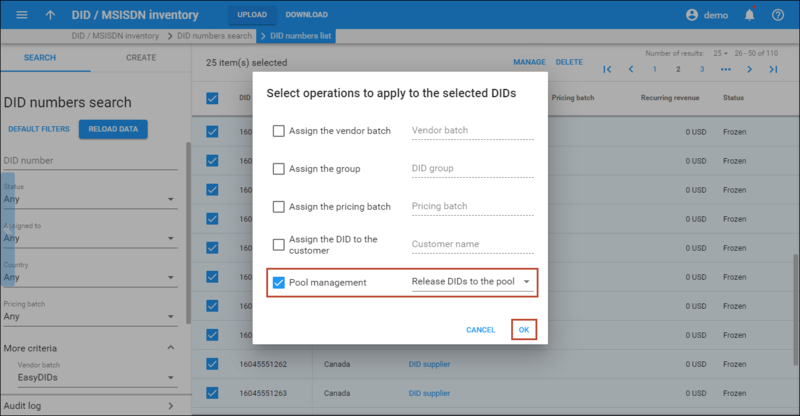 In the Select operations to apply to the selected DIDs dialog page, select Pool management, then select Release DIDs to the pool. 6. Click Ok. On the refreshed page you will see that the DID numbers have now been unfrozen and released to the DID pool. The pricing DID batch is a storage area for DID numbers that can be used for a particular purpose (e.g. to be provisioned to end users). 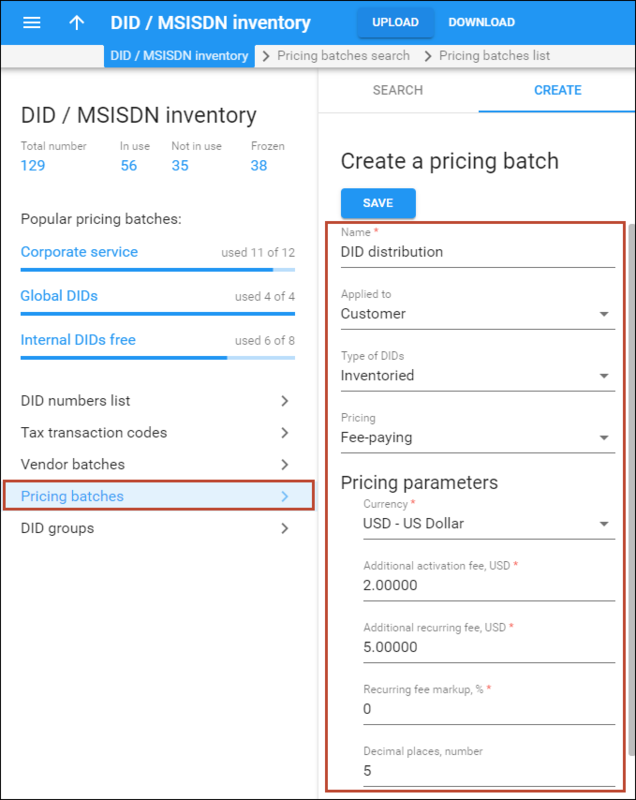 Pricing batches allow you to apply additional charges for using DID numbers. At this point create a pricing batch with a DID markup. · Name – Type a pricing batch name. o Additional activation fee – Type in 2 here. o Additional recurring fee – Type in 5 here. 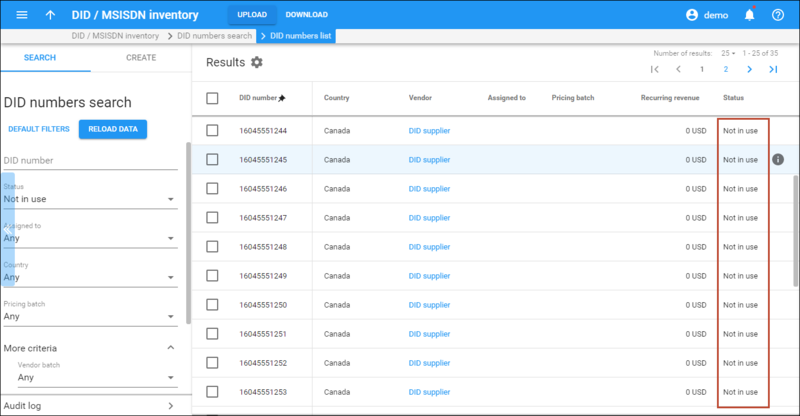 o Recurring fee markup – Specify a markup that will be included in the recurring amount charged to the customer in addition to the actual DID cost (charged by a DID vendor). To enable your DID buyers to access your DID inventory and provision the numbers, you need to create a DID provisioning customer. This acts as a placeholder for all provisioned DID numbers and allows you to control the billing for their usage. · Business model ­– A business model defines what type of service is to be provided to the customer. Select Universal here. · Balance control - Specify the way the customer will pay for the service. Choose Postpaid in this field. To control charges for provisioned DID numbers, assign the pricing DID batch to your DID provisioning customer. 1. On your customer’s panel, select Personal, then select General info. 2. On the Personal info panel, select Additional info. 3. 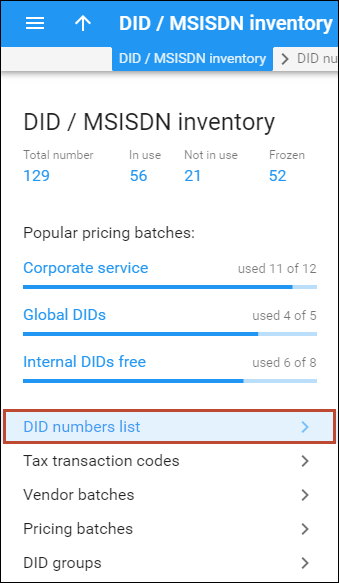 On the Additional info panel, select a previously created pricing batch in the Auto-provision DIDs via batch list. The configuration is finished. Now provide your DID buyer with the DID provisioning customer’s web self-care credentials. As soon as a DID number is provisioned from your DID inventory, it will have the In use status. If you provide hosting services to your customers (i.e. a customer operates in a separate billing environment), you can distribute the pool of DIDs across your own billing environments and allow customers to provision them on-demand. When a call is made to the DID number, PortaSwitch® detects the billing environment where it is provisioned as an account and delivers the call to the callee. To enable PortaSwitch® to detect a billing environment for an incoming call, it is necessary to configure the PortaSIP® dispatching SBC. For normal operation, the PortaSIP® dispatching SBC must be deployed on a separate physical server located at a separate site. For testing purposes, however, you can deploy it on one of your SIP servers within the existing site. For either type of deployment, assign the virtual IP address to the PortaSIP® dispatching SBC as the visible point of entry to your network. 1. Clone the currently active configuration. 2. From the Configuration Tree, select ClusterSuite->PortaSIPCluster. 3. Select the sip-cluster that you use to distribute the pool of DIDs. 4. Select the DispatchingSBC group. 5. In the vipaddr field specify the virtual IP address of your PortaSIP® Dispatching SBC. Since it is the point of entry to your network, the virtual IP address must be public. Important! The PortaSIP® dispatching SBC virtual IP address must not be defined as the service IP for any instances and must also not coincide with the PortaSIP® cluster virtual IP address. 6. Click the Instance create button. 8. Select the SIP server where the PortaSIP® dispatching SBC instance and its service IP will reside. Click Save. 9. Select the ForwardingRegistry group. 10. From the domestic_forwarding_list list select the billing environment(s) from where customers will provision the DID numbers. 11. Click the Save button to save the configuration and then the Verify button. 12. Verify the new configuration and click the Check / Apply button to apply it. Note that the Apache service will need to be restarted, therefore apply the configuration during off-peak times. 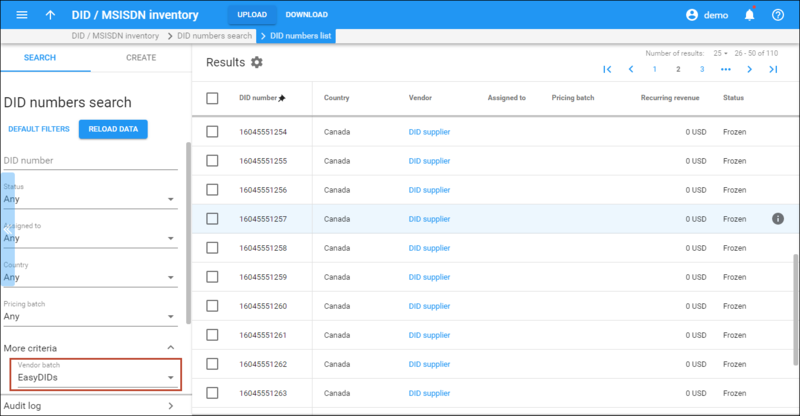 Complete steps described in Example 1 to grant customers access to your DID inventory for on-demand DID provisioning. Then on another environment configure the on-demand DID provisioning as described in the On-Demand DID Provisioning from PortaSwitch Owners handbook.